The Baldarian calendar is the most widely used calendar on Oberyon. It was named after Regent Baldaric Drun, who introduced its use in 2,400 AS. Baldaric chose to label the first year 2,400 after the common belief that man had arrived in the land now known as the Bay of Syrentus two dozen centuries earlier. The Baldarian calendar is 378 days long, the time it takes for Oberyon to make one revolution around its sun. Each year is divided into 9 equal months consisting of 42 days. It has long been rumoured that Baldaric introduced the calendar only after receiving pressure from the Clerics of Aladyra, who in the 24th century, were a force of great political influence. The followers of the Sky Goddess believed that the symmetry of the celestial cycles were a mirror of the perfection found in all creation. 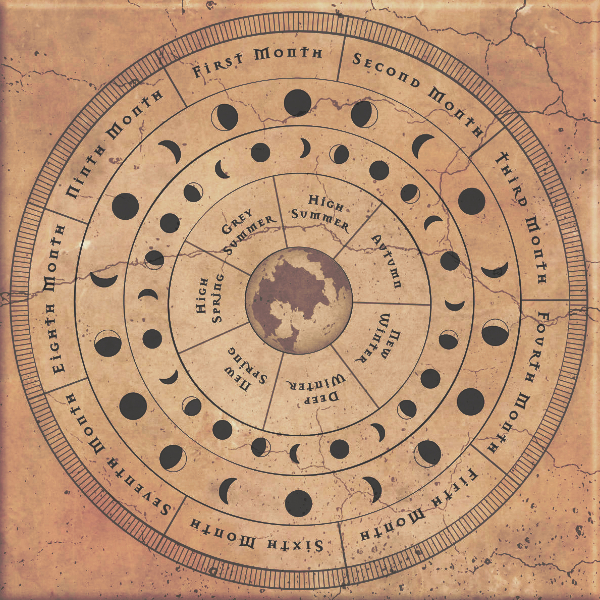 The Baldarian calendar also adjusted Oberyon’s lunar cycles so that each new cycle began when Onari (the blue moon) was full, and Volorus (the silver moon) was new, an event celebrated as Otopa Duna in Ka’Rudan culture. This created 7 Lunar Cycles each consisting of 54 days. The start and end date of each of Calambria’s 7 seasons were also altered slightly to align with this cycle. The Baldarian Calendar was adopted initially by the Circle of Kingdoms and its colonies. Over the next two centuries, it spread across the continent of Calambria, as well as being adopted in Tarsica, most of the Meryan nations, and the human settlements in the Hevanic Belt. In 3,465 AS it was adopted by Queen Nwali of the Ka’Rudan Empire. By the 5th millennium virtually all of Oberyon had adopted its use. The Haaken Empire is the last major nation to abstain, using their own calendar based on Ha’Akieran seasonal cycles. *The Syrentian calendar divided the year into 15 months; 12 months consisting of 25 days and 3 months consisting of 26 days. Diagram Note: Each of the lunar symbols represents one complete Lunar Cycle.